Liberty, with Form-Sensing Mesh Technology, is unlike any mesh chair you’ve seen or experienced. With its tri-panel construction, it has the body-fitting contours that single-panel stretch mesh chairs simply can’t achieve. And it offers perfect lumbar support for everyone, without external devices or manual adjustments. Liberty’s mesh back is formed by combining three panels of non-stretch meshHumanscale office furniture sales, Alliance Interiors Sutton West Ontario. in the same way a tailor combines multiple pieces of material to form a shirt. Its contours are custom-made to both fit and support the human body in unprecedented comfort. This is one of my favorite chairs and it is extremely comfortable. This mesh back task chair is what I consider to be “passive ergonomics.” This meaning that you literally do not have to adjust this chair to fit you. The weight of your own body does all the work. Each task arm adjusts independently and the gas lift works seamlessly. That’s it! No fancy leavers or adjustments. Great for people with back problems to make their seated position more ergonomic and comfortable. The Liberty Conference/Task Chair can be used in any workplace setting including conference and boardrooms, training rooms, home offices, hospitality lounges or hotel suites. 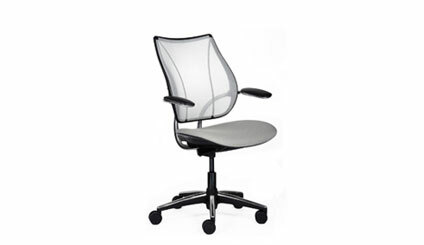 This can be used as a task chair in any work environment as the Liberty Conference task chair fits any user. Interior designers love the way it looks.